As the name suggests, The Boston Institute of Finance is based in Boston, home of legendary educators and investors. Financial services professionals consider The Boston Institute of Finance the premier online destination for increasing knowledge, growing their careers, and meeting critical certification requirements. We take pride in our heritage and reputation of preparing financial professionals for excellence, providing top ranked customer service and building upon the success that our name represents. We encourage you to use our exceptionally knowledgeable staff as a resource while you are exploring your options for selecting courseware appropriate for your personal goals. The Institute has invested considerable time to vet many programs and will gladly share its analysis with you. We hope to direct you to the courseware best matched to your learning style and one that will give you the opportunity to score your best. Formed in 2000, we are now the primary destination for world-class, brand-name clients seeking e-Learning solutions to monetize their IP online. Some of our former and current partners include organizations such as the Boston University, Wiley, Bryant University, Excelsior College, National Investment Companies Services Association and Keir Inc.. The Boston Institute of Finance selects its partners after performing extensive and recurring due diligence. The Institute, with a select group of partners, provides the most robust and successful programs for several top financial certifications. Our analysis is focused equally between the quality of a program's core content and our users' appraisal of its courseware and their personal outcomes. 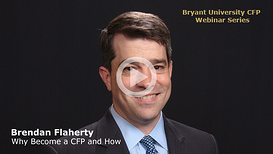 Informational Webinar: Listen to our Program Director, Brendan Flaherty, CFP®, CIMA®, for 20 minutes as he explains exactly Why and how to become a CFP®. Enrollment for Winter 2019 is now open. First class is 1/9/2019. Full Program packages start from $2695. Earn your Certified Mutual Fund specialist (CMFS) designation. Click here to learn more.